"Michael is a hell of a driver but I wish I could have a little bit of his luck as well." Those words, from Rubens Barrichello, pretty much sum up the general feeling in the Formula One paddock after Michael Schumacher completed one of his best ever races to take his 46th career win at the Malaysian Grand Prix, in dominant, spectacular and even epic fashion. The German driver and his Ferrari team were, as it happened two weeks ago in Australia, in a league of their own, and the circumstances - namely the weather and their tyre choice - made them look even more out of reach. Schumacher overcame his own mistakes by taking the risk of running intermediate tyres when the Malaysian heavens opened wide and rain began flooding the track. The reigning World Champion and his teammate were the only ones not to use full wet weather tyres, and their decision immediately paid off. Following a synchronised off-track excursion, things looked awfully bad for the Ferrari drivers, lying in 10th and 11th place when the safety car left the track. But their intermediate rubber was clearly the way to go, at least for them, and within a couple of laps, Schumacher was in the lead after overtaking every single one of his rivals, making it look almost too easy, and lapping four, five and even six seconds quicker than the rest of the field. That left the rest of the field wondering what is left for them, after watching the pace and reliability of the Ferraris. The McLaren team seemed to have tried something radical in order to close the gap that was so evident in Melbourne, and they seemed to have got it totally wrong, increasing that gap even more. David Coulthard's ephemeral lead and subsequent third place was the best they could have hoped for after a dismal qualifying session. Coulthard didn't seem to do anything wrong, and as his team boss Ron Dennis defended, the decision to switch to wet tyres was probably the right one for the McLaren drivers who, simply said, are not Michael Schumacher or Rubens Barrichello under the given conditions. Mika Hakkinen struggled all day long, being unable to recover from the lost time at the start of the race, and being stuck behind a sensational Jos Verstappen during a large part of the race. Whatever's wrong with the McLarens, it seems to be very wrong, and they will be hoping that the European races help them to stop a record-breaking season for Schumacher and Ferrari. For most of the weekend, one of the most intriguing issues and one of the most repeated questions amongst experts and fans was "Is Williams back?" The BMW-powered team seemed to hold the upper hand over their Mercedes-powered rivals at McLaren, courtesy of a brilliant Ralf Schumacher, who forced his brother to pull out all the stops to grab pole position. At a track where they have struggled in the past, the Michelin-shod Williams demonstrated once more they are on the right track to return to the top of the sport, though as the younger Schumacher predicted after qualifying, the race was a totally different matter, but it would have been very interesting to see what the German could have done had he not been forced into a spin at the first corner. Despite this demonstration of superiority from Schumacher, Formula One at Sepang was almost everything it is supposed to be, with plenty of excitement, overtaking and good racing. On the other hand, though, two issues were highlighted once more during last Sunday's race. With safety under the spotlight after the tragic events in Melbourne, it was somewhat worrying witnessing how every single car that left the track when the torrential rain began to fall, could have easily run across the gravel traps and rejoined the race. Almost every driver ran off the track and through the traps, proving once more their inefficiency when it comes to stopping the cars, or even just slowing them down. The second issue was the entry of the safety car at a time when the cars were struggling to stay on the black stuff. It is understandable that the safety car is deployed while the marshals are trying to clear the track, especially considering that cars spun off even following the silver Mercedes. Staying on track for as long as some unwritten rule indicates is a totally different subject which not only irritates most of the fans, but also affects the outcome of the race in an artificial manner. Finally, the Malaysian Grand Prix confirmed what the FIA feared after the first race of the season, as the cars were again much faster than last year. Schumacher's pole was more than two seconds quicker than in 2000, when the race was the final event of the season and the tyres were fully developed. A two second difference in only the second race of the year, when the tyre war has just begun, promises changes will come, and probably soon. 'Heat' and 'understeer' were probably the two most repeated words after qualifying for the Malaysian Grand Prix, where Michael Schumacher faced tough opposition from an unexpected rival in the form of his own brother Ralf, to clinch yet another pole position - his 34th and sixth in a row. With a track temperature of 45 degrees Celsius at the start of the session, it took twelve minutes before any driver would come out of their artificially-cooled pits. It was David Coulthard who set the initial pace amongst the big boys, already beating Schumacher's pole time from last year by nearly two tenths of a second. Mika Hakkinen was also one of the first top drivers to come out, but the Finn was only able to demonstrate his car was not in the shape he expected, unable to grab provisional pole at least once during the hour-long session, something that was rare to watch. "We have a problem," Hakkinen later admitted, "which affects us in the last sector. We know what the problem is, but we just haven't been able to solve it yet." The first sign of Ralf Schumacher's pace came when the young German leaped into first place with a time almost a second quicker than Coulthard's. The BMW engine was clearly giving the FW23 the required power and, if BMW's boss Gerhard Berger is to be believed, the German unit is probably the highest revving in Formula One this season, reaching more than 18,000 rpm. Rubens Barrichello was to bring matters closer to reality with 38 minutes remaining in the session when, on his first attempt, the Brazilian lapped three tenths faster than Ralf. That wouldn't last, though, and when Michael Schumacher - the last driver to come out of the pits - hit the track, he immediately topped the time sheets. The German was a massive seven tenths faster in the second split, but lost his car near the end of the lap, losing most of his advantage in a lap that would have probably been the fastest of the session. Ralf would demonstrate his intentions were serious again when, 35 minutes into the session, he would relegate his older brother to second place. But the Williams show would be also helped by Juan Pablo Montoya. The rookie, who had been unable to complete a timed lap during Friday practice due to mechanical problems at a track totally unknown to him, jumped to fourth spot on his second run. Still struggling with the MP4-16, Hakkinen was the last driver to complete his second attempt with only 18 minutes to go to the end of the session, the Finn moving up to fifth position. His teammate Coulthard wasn't so lucky, and his fastest time, set on the second of his four runs, would incredibly stay as his best performance. It wasn't until his third attempt that someone, in this case Barrichello, would displace Ralf from the top of the list, lapping for the first time in the 1:35s. But Michael Schumacher immediately reacted and stole his thunder, only for Ralf to steal his, with a time only 86 thousandths of a second quicker. His delight, as well as the team's, was evident from the on-board camera shots which showed him punching the air. This was no fluke, he was really fighting for pole, and Michael knew it. In an uncommon move, Schumacher started his last attempt seven minutes before the end of the session and, most importantly, before both Barrichello and Ralf. The triple World Champion pushed his car and set a 1:35.220 - more than two seconds faster than his own pole from 2000. The fraternal battle seemed to be well over until Ralf started his final attempt and the screen reflected he was fastest in the first split, where his car was probably the best. The dream, however, was finally over after being four tenths slower in the second split. Ralf could hardly believe how close he was. "I am definitely surprised, I didn't expect to be so close to this position, especially after where we were yesterday," admitted Ralf, who nevertheless kept his feet on the ground. "I don't see ourselves out-racing Ferrari and McLaren tomorrow, partly because Michelin haven't ever raced on this track. It was great fun for us both to fight like that and I can only imagine how my father and my mother must have been feeling." His brother, who grabbed his 34th career pole position - second only to Ayrton Senna - was also delighted after fighting with his own flesh and blood. "It was fun with Ralf, but somebody should tell him that he's young and that things should be built up," joked Schumacher. "He put in a good performance and he was quick throughout the session." The last seconds of the session saw Barrichello spoiling the first brotherly first row in the history of the sport, elevating himself up to second place, thus completing the second Ferrari front row in two races, relegating Ralf to the second row alongside Hakkinen. The Finn completed one of his banzai laps to jump up to fourth spot, still struggling with poor balance, ending the session a massive eight tenths of a second behind the pole time. Further back, Jarno Trulli was fifth and the top Honda runner, while Montoya completed a fantastic day for Williams, sharing the third row with the Jordan driver. Put in perspective, the Colombian's performance was brilliant, though his real ability probably won't be seen until the European season. Jacques Villeneuve's BAR was seventh, in front of David Coulthard, who endured one of his worst performances in recent times. Heinz-Harald Frentzen and Olivier Panis rounded up the top ten, while the likes of Jaguar and Benetton continued to battle in the back of the field hoping for better times when they arrive in Europe. Following the heavy overnight showers, the warm up session took place in the wet, highlighting what was to happen during the race. Before the start of the race, however, the Malaysian weather was benevolent and the skies cleared up, with track temperatures of 41 degrees Celsius. Just minutes before the pitlane closed, Michael Schumacher was forced to jump into the spare car following an oil leak in his race car. Brazilian rookie Enrique Bernoldi had to follow suit, enduring yet another episode of a weekend to forget, especially after his qualifying times were deleted due to an irregularity with his car's bodywork, forcing him to start at the back of the grid. Heinz-Harald Frentzen was also hit by trouble, this time on the formation lap, his Jordan misfiring badly, looking like the end of his race. Lady luck, though, was on the German's side, as when the cars were lining up on the grid, Giancarlo Fisichella missed his slot and ended up stranded in the middle of the grid, forcing the start to be aborted, subsequently allowing Frentzen to regain his position. "We were very lucky today," admitted Frentzen. "I had a strange electrical problem and the engine wouldn't rev while I was on my way to the grid. Luckily there was a restart and that meant there was time to reset the electronics." As the second formation lap began, it was Juan Pablo Montoya who struck problems with his Williams, getting stuck on the grid, his engine dead. The Colombian had to rush into the spare car and take the start from the pitlane. The race was finally underway, that is for everyone except for Kimi Raikkonen, whose transmission broke before he was able to make it to the first corner. Schumacher took off in perfect style, keeping his lead at the end of the straight. Barrichello did not get away so quickly, and he was pushed both by Ralf Schumacher on the outside and Jarno Trulli on the inside. Ralf got ahead to the first turn, but Barrichello was still on the inside and an incident was inevitable, though perhaps the Brazilian should have let the German go. That was not the case, and the Ferrari touched the back of the Williams, forcing him into a spin that would send him to the back of the field. "The collision with Barrichello at the first corner is hard to understand," Ralf explained after the race, "because usually the car that is in the front has the priority on the corner." The Williams driver was not the only one who lost places due to his spin, as Mika Hakkinen was forced to slow down in order to avoid the spinning car, losing several positions, ending up in eighth place. Teammate David Coulthard probably made the best start of all, aided by the fact that he had no car in front of him, as Montoya was in the pitlane. The Scot managed to jump up to fourth spot, essentially trading places with his teammate. 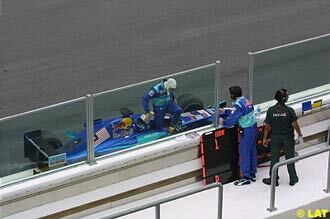 Olivier Panis's race lasted only two laps, as his Honda engine exploded, pouring oil on the track. Additionally, it didn't last long before the clouds covered the sky and it began to rain. That, added to the oil from Panis's engine, caught the two Ferraris off guard, and both Schumacher and Barrichello slid off the track at the same time. Luckily for them, both cars remained almost intact, and they were able to rejoin. The Brazilian, however, lost a barge board and damaged the other. Trulli inherited the lead when suddenly the Malaysian skies began raining cats and dogs, flooding Sepang and creating chaos all over the circuit. 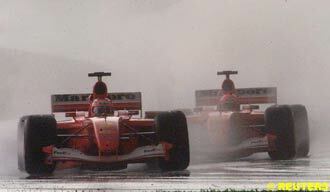 Jacques Villeneuve, Eddie Irvine, Montoya and Bernoldi were the first victims of the weather, spinning off and ending their race in the gravel. Trulli also spun while in the lead, though he was able to drive across the gravel trap and into the pits. By this time the race officials had decided to deploy the safety car, a sensible decision considering there were many cars stuck in the gravel and the ones that were not in it, were running across it. 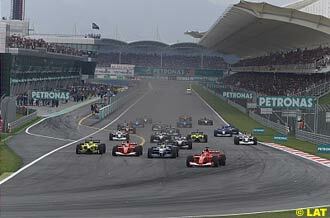 The cars continued to spin even with the safety car on track and with wet weather tyres. 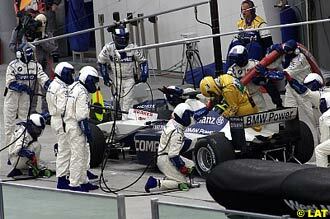 Barrichello, who was one of the first drivers to come in, saw how his mechanics had Schumacher's tyres ready for him, losing a lot of time in the pits. As if that wasn't bad enough, the front right tyre was missing, something that Ferrari has been renowned for in the last two seasons. Once everyone had pitted, Coulthard was the surprising leader, while the Ferraris, who had opted to put on intermediate tyres unlike the rest of the field, were 10th (Barrichello) and 11th (Schumacher) following their disastrous pitstop. As Schumacher said on the radio after the race, "I should have had a cup of coffee while I was waiting there." While Coulthard was in the lead, Frentzen had emerged in second place, Jos Verstappen was third, Hakkinen fourth, Trulli was in fifth place and Jean Alesi had moved up to sixth. The safety car stayed on track until lap 10, several laps after the gravel traps had been cleared. What the reasoning was behind the decision to keep the race under control for so many laps remains a mystery. When the race finally got under way again, Coulthard began to edge away from Verstappen, who immediately demonstrated his skill under these conditions and passed Frentzen for second place. Meanwhile, at the back, Barrichello and Schumacher had already began their charge to the front, with the German overtaking his teammate on lap 12, something the Brazilian wasn't too happy about. "At that time, I would say a teammate should just stay composed and should wait for some chances in front, but that's how it went," complained Barrichello. Schumacher, though, was clearly faster than the second Ferrari driver, and it soon became obvious that both men had taken the right tyre decision, lapping up to six seconds faster than the leaders. Within four laps, Schumacher had overtaken everyone and was already in the lead, with only Verstappen giving him a relative hard time. On lap 16, Barrichello moved up to second place, as the track began to dry up. Schumacher and Barrichello continued lapping at least five seconds faster than Coulthard, and it was clear that only a mechanical problem could stop the Ferrari duo from taking the win. By lap 19, Schumacher's gap over Coulthard was more than 20 seconds. Hakkinen and Ralf Schumacher were the first to switch to dry weather tyres on lap 17. Ralf was now the man on the move, moving up quickly. Barrichello pitted on lap 21, again a very slow pit stop, falling down to fourth place. Meanwhile, Coulthard - who on lap 25 was already a massive 40 seconds behind Schumacher - finally came in for his scheduled stop, rejoining third, more than 20 seconds behind Barrichello. It wasn't until lap 30 that Schumacher pitted, when he was well over a minute ahead of his teammate and about to lap... Hakkinen! The Finn was struggling behind Verstappen in sixth place, and the Dutchman seemed to be clearly in control in front of a poor-handling, very-slow-on-the-straight McLaren. "I didn't spin," said Hakkinen. "But I was driving so carefully, so slowly." 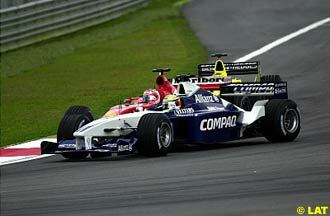 With more than half a minute advantage over his teammate, Schumacher ran an uneventful second part of the race. The same could be said about Barrichello and Coulthard, though the battle for fourth spot between Verstappen, Hakkinen and Frentzen entertained the fans for quite a long time. 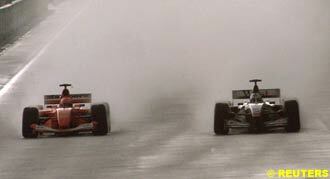 The Arrows driver seemed untouchable until Hakkinen got close enough to try to pass him. It didn't work, both cars ran wide, and it was Frentzen who took the opportunity to pass Hakkinen. He would move up to fourth when Verstappen made his third stop. Ralf also dropped to seventh after stopping for the third time on lap 38, beginning yet another charge to the front. Hakkinen, who hadn't loaded any fuel on his second stop, came in two laps later, and when he rejoined he finally found the pace he had lacked earlier in the race. The Finn set the fastest lap three times. Too little, too late, though. Barrichello made his final stop on lap 41, rejoining some six seconds in front of Coulthard, who for a while seemed to be able to close the gap, but at the end of the day settled for third. Schumacher cruised to the checkered flag, finishing more than 20 seconds in front of Barrichello, who helped Ferrari complete their first 1-2 since the USA Grand Prix last year. 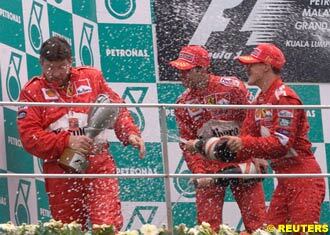 "I thought it was all finished when the rain started and I went off the circuit," admitted Schumacher. "We were lucky the cars stood in shape and didn't get heavily damaged and we were able to do the race we did finally. "It was my call to go on intermediates, and we knew we would struggle for a number of laps. But we knew it would be better for the end and that is the way it was." Frentzen was fourth, while Ralf Schumacher ended fifth, a result which didn't seem to reward his efforts after battling his way up the field several times during the race. The German also gave Michelin its first points since its return to Formula One. Hakkinen took the last point, unable to pass the Williams despite his pace at the end of the race. Verstappen's performance was left unrewarded after finishing in seventh spot. It was only the second round of the championship, and it would be an error to discount McLaren to fight back, but what Australia suggested was confirmed in Malaysia: Ferrari are a long way ahead of their rivals, and best of all for them, it is yet unclear who their rivals really are this year. Before the start Michael Schumacher and Enrique Bernoldi switch to the spare cars. As the grid lines up Giancarlo Fisichella misses his grid slot and is stranded in the middle of the grid. The start is aborted and Fisichella is sent to the back of the grid for the restart. As the cars headed off on the second parade lap Juan-Pablo Montoya is left behind. He deserts his car and goes to the spare. Lap 1: At the start Michael Schumacher makes a good start but Rubens Barrichello is slow away and is challenged by both Ralf Schumacher on the outside and Jarno Trulli on the inside. At the back of the grid Kimi Raikkonen's Sauber fails to get off the line. 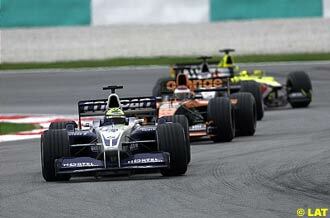 As the frontrunners brake for the first corner Ralf Schumacher and Barrichello touch and the Williams-BMW spins. All the other cars are able to avoid a crash but Eddie Irvine nearly spins his Jaguar avoiding a crash and loses several places. At the end of the lap Michael Schumacher is 1.3 seconds ahead of Barrichello, Trulli, David Coulthard (up from eighth), Heinz-Harald Frentzen and an incredibly fast-starting Jos Verstappen, who goes from 18th on the grid to sixth. Lap 2: As the two Ferraris pull away at the front ninth-placed Olivier Panis suffers a major mechanical failure and spins off at Turn 6, leaving oil on the road. 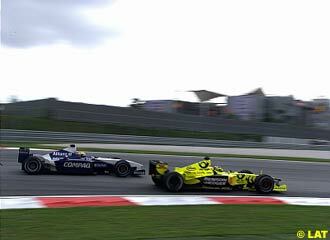 In the middle order Fisichella overtakes Jenson Button for 11th place. Ralf Schumacher moves up from 20th to 14th. At the tail of the field Fernando Alonso drops into the pits. Lap 3: Michael Schumacher and Barrichello both go off on Panis's oil at Turn 6. The two cars bounced across the gravel beds but both are able to rejoin. At the same moment it begins to rain. Trulli takes the lead with Coulthard second, Barrichello third, Frentzen fourth, Vertsappen fifth and Jacques Villeneuve sixth. At the tail of the field several cars stop for wet tyres. Both Benettons come in at the same moment and Button has to wait until Fisichella's car departs. Luciano Burti, Tarso Marques and Irvine all stop. Irvine does not rejoin. Lap 4: With the track deluged by rain many drivers spin off. Villeneuve, Bernoldi, Montoya and Nick Heidfeld all go off and are not able to continue. Both Trulli and Coulthard spin and Barrichello has a second off. 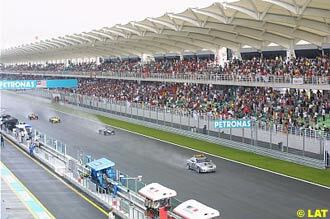 A Safety Car is despatched and the race placed under caution. Everyone pits. Both Ferraris come in together and Michael Schumacher has to wait until Barrichello departs. He loses more than half a minute but with the Safety Car on the track this time was quickly made up. Lap 5: The order behind the pace car at the end of the lap is Coulthard, Verstappen, Frentzen, Hakkinen, Trulli and Jean Alesi. Lap 11: The race restarts with Verstappen passing second-placed Frentzen while Ralf Schumacher jumps from eighth to fifth, passing Fisichella. Alesi and Trulli. 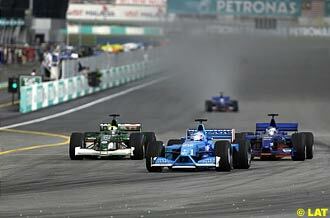 Barrichello and Michael Schumacher move from 10th and 11th to eighth and ninth places. Lap 12: Hakkinen and Ralf Schumacher pass Frentzen. 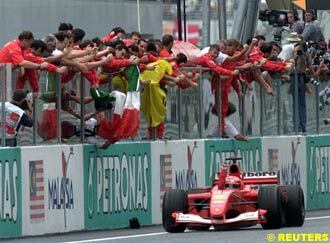 Michael Schumacher passes Barrichello and both Ferraris pass Alesi and Trulli. Alesi is also overtaken by the two Benettons and ends up 11th. Lap 13: Michael Schumacher passes Ralf Schumacher, Frentzen and Hakkinen to move to third place. Frentzen is also overtaken by Barrichello. In the midfield Button spins and drops to 13th. Lap 14: While Michael Schumacher attacks Verstappen for second place, Barrichello passes Ralf Schumacher and Hakkinen to move to fourth place. Lap 15: Michael Schumacher passes Verstappen and chases after the leader Coulthard. Lap 16: Schumacher overtakes Coulthard to take the lead. The Ferrari driver laps five seconds faster than Coulthard. Barrichello, racing a similar pace, overtakes both Verstappen and Coulthard to move to second. Lap 18: Both Hakkinen and Ralf Schumacher stop for new tyres and drop from fifth and sixth to eighth and 11th places. At the tail of the field Alonso pits for a third time. Lap 19: Schumacher has made over 20 seconds in four laps over third-placed Coulthard while Barrichello cannot keep up the pace and drops to nearly 10 seconds behind his team mate. Lap 20: Fisichella pits and drops from seventh to 14th. Ralf Schumacher begins to charge back again, passing Alesi to take ninth place. Lap 21: Barrichello pits and falls to fourth place. Frentzen also pits from fifth place and drops to seventh. Ralf Schumacher overtakes Luciano Burti for eighth place. Lap 22: Verstappen stops and re-emerges from the pits in fifth place. This puts Barrichello back to third with Trulli fourth ahead of Verstappen and Hakkinen. Frentzen is seventh with Ralf Schumacher closing fast on him. Lap 23: Trulli pits and drops to eighth place. Further back Burti and Alesi also come in for their scheduled pit stops. Lap 24: Ralf Schumacher passes Frentzen after a side-by-side for four corners. Lap 25: Coulthard, who has lost 40 seconds in 10 laps to Michael Schumacher, pits. He rejoins third nearly 20 seconds behind Barrichello. Lap 28: Hakkinen is overtaken by Ralf Schumacher for fifth place. Lap 30: Michael Schumacher finally stops. He is 68 seconds ahead of Barrichello. He rejoins with a half minute advantage over his team mate. Lap 31: Ralf Schumacher passes Verstappen for fourth place. Lap 32: Fisichella retires from ninth place. Lap 34: Hakkinen is unable to pass Verstappen's Arrows and Frentzen closes up on the pair of them. Lap 38: Barrichello stops again but remains second as Coulthard has dropped to half a minute behind. The Verstappen-Hakkinen-Frentzen battle ends up with the McLaren being forced wide by the Arrows and Frentzen is able to get ahead of Hakkinen. Lap 39: Eighth-placed Trulli has his second stop but keeps his position. Lap 40: Hakkinen pits for his second stop and loses a place to Ralf Schumacher. Lap 43: Verstappen stops for his second stop and drops from fourth to seventh. The top six is set with Michael Schumacher 40 seconds ahead of Barrichello, Coulthard, Frentzen and Ralf Schumacher although the Williams soon comes under attack from the recovering Hakkinen. Lap 55: The race ends with Michael Schumacher having scored an amazing victory with only one fuel stop, having lapped five seconds a lap faster than his rivals despite the fact that they were running with lighter fuel loads. Michael says the victory was down to his decision to use intermediate tyres rather than full wets during the early race rain storm. German Schumacher made a good start in the spare Ferrari but went off on the oil from Olivier Panis' BAR on lap 3. He rejoined and soon pitted as the rain began to fall, but was left waiting as his team were slow to complete Rubens Barrichello's stop. He moved back into the lead two laps after the safety car came in and led his team mate home for a Ferrari one-two. Brazilian Barrichello was running second when he followed his team mate into the gravel on lap 3. 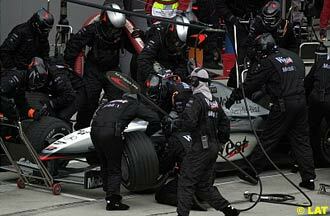 He spent 72 seconds in the pits when his team put Schumacher's tyres on his car then could not find his right front when they tried to replace them. He recovered to finish a fine second. Briton Coulthard had a fantastic start to move into fourthh place from eighth on the grid on lap one. He took the lead when Jarno Trulli went off on lap four, but could not match the pace of the Ferraris and dropped to finish third. Finn Hakkinen was beaten off the line by his team mate.He improved his pace towards the end of the race but could not pass Ralf Schumacher's Williams and claimed just one point. 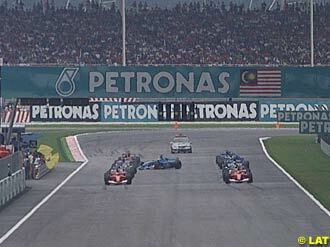 Schumacher spun after touching Rubens Barrichello in the first corner but re-oined and moved up to fifth as the safety car came in on lap 3. He stayed there until the end and held off a late challenge from Hakkinen to claim two points. Colombian Montoya failed to get away on the second parade lap as his car suffered engine problems. He started from the pit lane in his spare car and his race ended when he went off in the rain on lap 4. Briton Button started towards the back of the grid in 17th and in an uneventful race for him he finished in 12th place. Italian Fisichella missed his place on the grid and caused an aborted start. He was forced to start from the back of the grid and retired in the pits on lap 33. Frenchman Panis ended his race in the gravel when his engine blew and he spun out on lap two, dropping oil to cause problems for the front-runners. Canadian Villeneuve ran in the top 10 before becoming a casualty of the rain as he spun off and ended his race in the gravel on lap 4. German Frentzen suffered a misfire on the first parade lap but was able to return to his grid position after the aborted start and moved up to fifth from ninth when the lights went out. He dropped down to seventh but followed Jos Verstappen past Mika Hakkinen on lap 39 and moved into fourth when Dutchman Verstappen pitted. Italian Trulli moved up to third off the line and took the lead when the Ferraris slid off the track. He also went off in the rain just before the safety car came out but ran well in the middle of the race and finished a lap down in eighth after three pit stops. Dutchman Verstappen made a stunning start to move up to 6th place from 18th on the grid. He survived a stewards' inquiry at the start and was up to second when the safety car went in. He remained competitive until a late final pit stop meant he finished out of the points. Brazilian Bernoldi started from 22nd on the grid after having his qualifying time disqualified for illegal bodywork and spun off on lap 4 to end his race in the gravel. 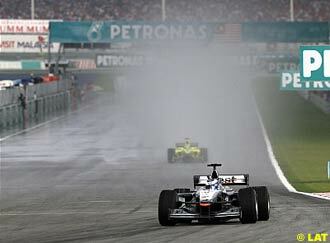 German Heidfeld started from the midfield and went off on lap 4 with a blown engine as the rain began to fall. Finn Raikkonen stopped with just a few yards completed when his car failed to work as it left the grid. Brazilian Burti remained unaffected by the rain and had a consistent race at the tail of the field, finishing in 10th position. Briton Irvine was hit by an Arrows on the first lap but recovered to move up the field before spinning off on Panis' oil to end his race in the gravel on lap 4. Spaniard Alonso pitted five times during the race and capitalised on the reliability of his Minardi to finish 13th, three laps down. Brazilian Marques made a mistake by staying out too long on wet tyres and suffered a stripped tread. He rejoined after a pit stop, and finished four laps behind the leaders in 14th and last place. Frenchman Alesi had a consistent race to finish one lap down in ninth place. Argentine Mazzacane converted his 19th place on the grid into an 11th place finish with a steady if slow race.